Business coach Heidi Stevens has created a calm, curated family oasis. Potter Mallis Custom Cabinetry | Restoration Hardware Dining Table | Eames for Herman Miller Dining Chairs | Design Within Reach Sofa | Venice Plants Potted Plant | Ay Illuminate Chandelier | Bowl, Vase, Stylist's Own | Teak Warehouse Outdoor Table | Teak Warehouse Outdoor Bench Seat. Photographed by Morgan Pansing for Lonny. It's a good thing Heidi Stevens is in the business of calm. "We were living in the neighborhood and eventually decided that our ideal home was on a much larger lot," explains the Los Angeles-based, soulful business coach. "After looking at several homes on the market, we realized that the only way we were going to get what we wanted, was if we built it ourselves. The house that was originally on this site was the worst home on the street — so we rebuilt it — from the ground up. It was a two year process from purchasing the land to actually moving in." Step inside the light family style oasis and you'd agree that two-years of hard work has certainly paid off for the mom of two and busy entrepreneur. 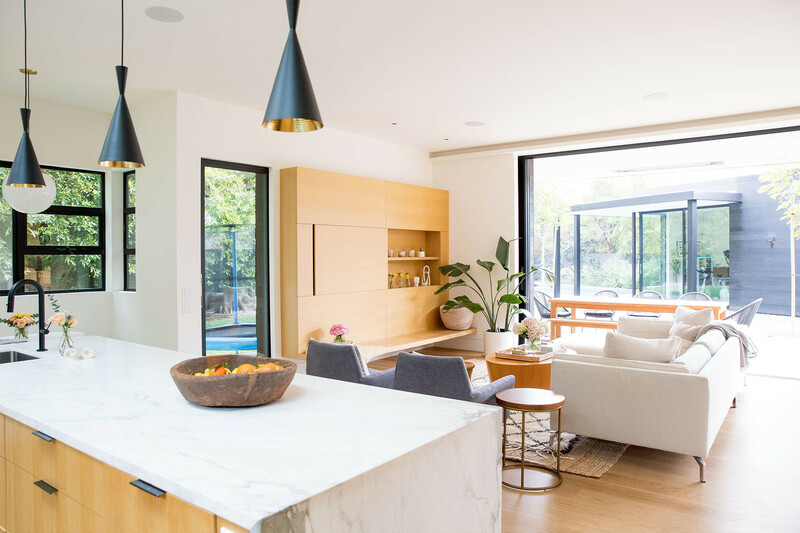 A modern, open kitchen and contemporary living area seamlessly blend into one — as the sunny, teak interior floods out onto a manicured courtyard and lawn, complete with a swimming pool. When you close your eyes for a second and try to picture the epitome of 'indoor-outdoor flow,' chances are you're envisioning some place a lot like this. Stevens' home serves a dual purpose. 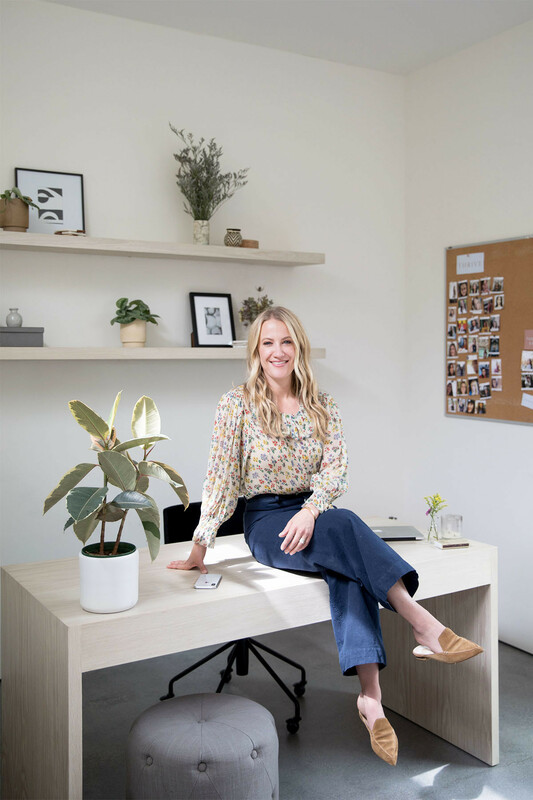 After launching her successful coaching business in 2017, an initiative that supports creative female entrepreneurs across all facets of their business — Stevens set out to create an environment that echoes both her work and her family, opening up her home to host many of the company's intimate events and workshops. "My life and schedule are full, so it’s important that my home environment is calm and is a place I can exhale," explains Stevens. "I think of our approach to design as "warm minimalism" — it's clean and simple, yet inviting, and ultimately approachable. Our entire downstairs area is so wide open, with a 30-foot opening to the backyard. I love hosting, gathering, and relaxing here," she says. "We aim to bring entrepreneurial women together, here at home, for different gatherings, and my team has it down to an art form, how quickly we can remove all of the kiddie stuff and turn the living areas in to a gorgeous space, fit for all of my clients and community." 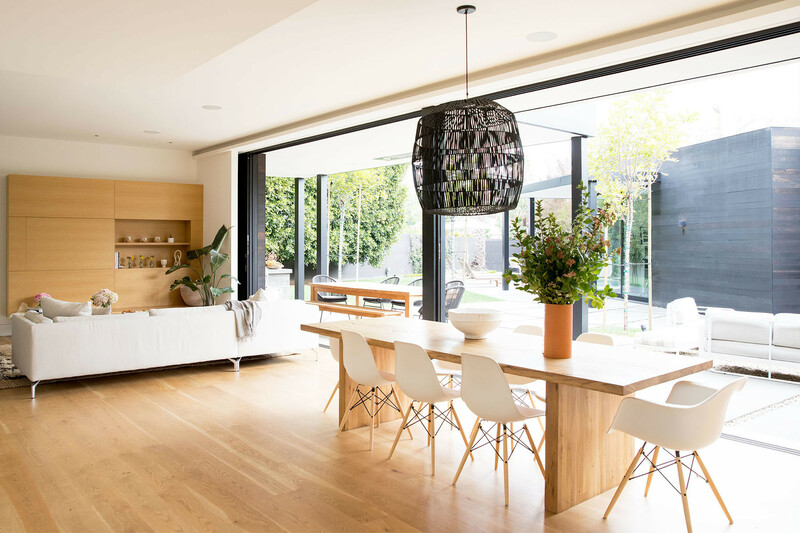 An open-plan kitchen holds pride of place in the contemporary family home. Potter Mallis Custom Cabinetry | Tom Dixon Pendant Lights | Hay Bar Stools. The versatility of Stevens' space is reaffirmed through its ability to shift, tweak, and mold to suit. Contemporary yet classic furniture anchors the family's lower living level, creating easy, achievable hubs within the wide open space. A custom Carrara marble counter holds pride of place in center of the ample kitchen area, decorated accordingly with clean and simple Hay bar stools. Neighboring the wall-spanning sliding doors, a plush, family-style sectional (by Design Within Reach) is sitting precisely where you'd want it to, inviting you to put your feet up and relax. 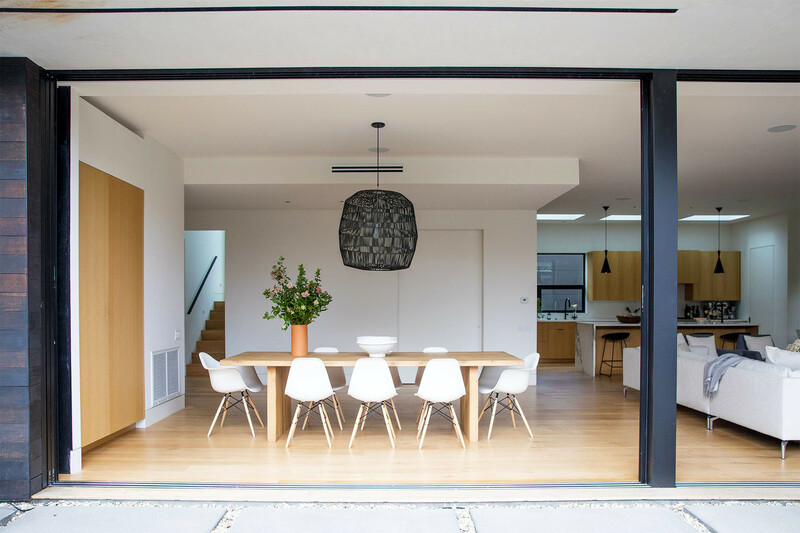 The understated dining table — dotted with Eames chairs — beckons you to gather round for dinner. Stevens' has achieved what many set out to, but few do well —a low-maintenance blend of substance and style. The 30-foot sliding doors open up onto a relaxed and ultimately modern outdoor area. Restoration Hardware Dining Table | Eames for Herman Miller Dining Chairs | Ay Illuminate Chandelier. "My dear friend, Lili Pettit of Clutter Healing, taught me years ago that everything needs a home," the entrepreneur explains, when asked how she set out to achieve the resounding sense of balance that echoes throughout her home. "For the most part, things have a place to go, they aren’t just hanging around the house. We try to avoid stuffing things behind the cabinet or hidden behind closet doors," she adds. "I can feel when I walk into a room if it’s "energetically heavy" and I have also learned over the years, from owning homes, that letting go of items is a constant process." Stevens admits she made a conscious effort to steer clear of furniture that could be deemed "too precious" for daily life. 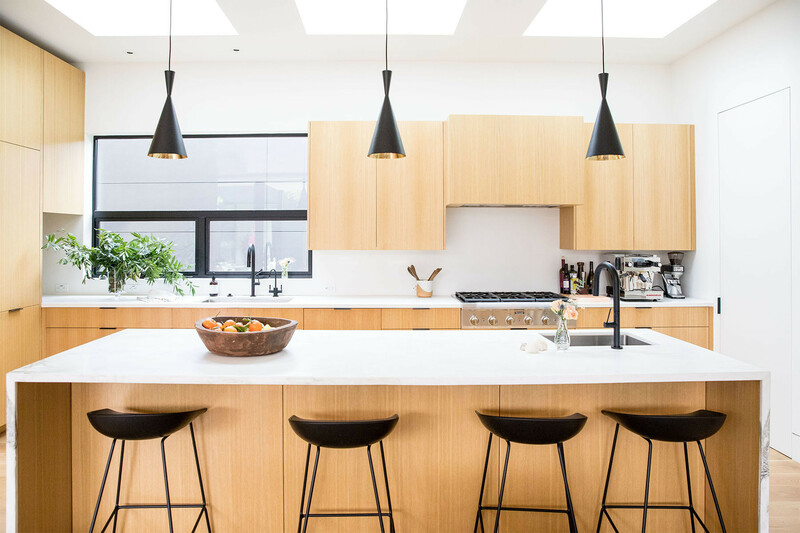 Hay Bar Stools | Tom Dixon Pendant Lights | Potter Mallis Custom Cabinetry. Stevens admits that maintaining order in her warm-but-minimalist household is an ongoing work in progress, but a quality she believes is testament to her family, first and foremost. The soulful business coach, who inspires, motivates and encourages women for a living, shares her home with husband, Kenny, son Harrison, and baby girl, Grace. "When people walk into our home and say that it has "good energy," I think it’s a combination of the fact that we are minimalists with our "stuff," partnered with the fact that we genuinely love our home." 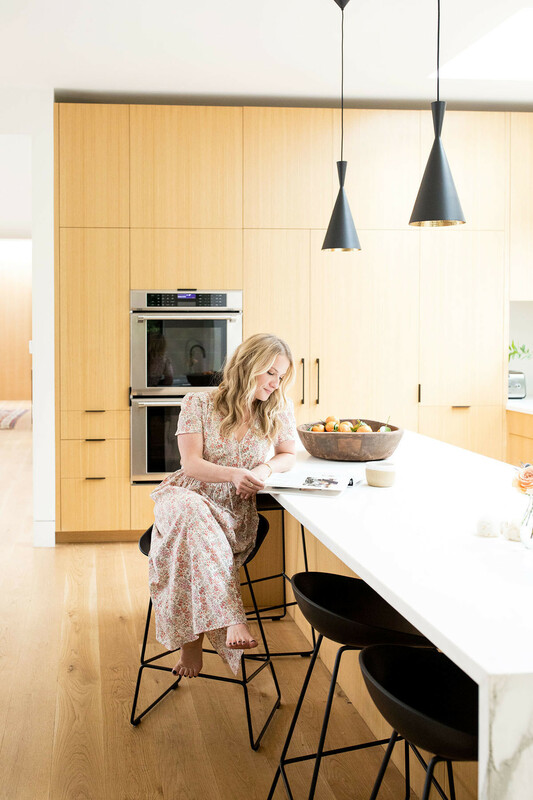 "While I built the house exactly how I wanted it to be — even though people told me I was crazy to do white matte walls — I have been a bit more practical with my choices in furniture design, being a mother," Stevens admits. "I probably would have picked a different dining chair, but with two kids under five, we decided to go with the Eames for Herman Miller plastic chairs. I love the fact the kids can spill spaghetti on them and it doesn’t bother me in the slightest. Our home is meant to be lived in, and it’s important that both our family and our guests are comfortable. I want people to feel like they can actually put drinking glasses down on the surfaces, or come in with their shoes on." While designing your dream home with family in mind may feel like a no-brainer, practicality all too often prevails over considered, curated design. Stevens accents her space with earthy, lived-in textures — like heady Room & Board coffee table, a solid addition to the primary living area, partnered with the linen-clad sectional sofa, upholstered in a crisp shade of lily white. It's a beautifully attainable example of just how good "practical" can look. "I try to stay away from pieces that feel too trendy, and colors or details that are too loud, or too distracting," Stevens explains. "My husband also has to have everything be super functional, so we trialled a lot of couches and chairs before we made our decision, to find the ones we compromise on! I love the sofa we landed on, the Como Corner Sectional from Design Within Reach." "I also love the main living space built-in — which includes a sliding door feature that covers the TV," says Stevens. "I didn't want people walking into our home and immediately staring at a black box, but this still gives us the ability to have a television in the main living space, when we choose to. Potter Mallis, the design build on the project, did all of the carpentry throughout, and their work is gorgeous." The couple decided to conceal their TV, enlisting the help of designers Potter Mallis to create custom built-in cabinets. Potter Mallis Custom Cabinetry | Tom Dixon Pendant Lights | Design Within Reach Sofa | West Elm Side Table | Merchant House Vintage Rug | Room & Board Coffee Table | Venice Plants Potted Plant. 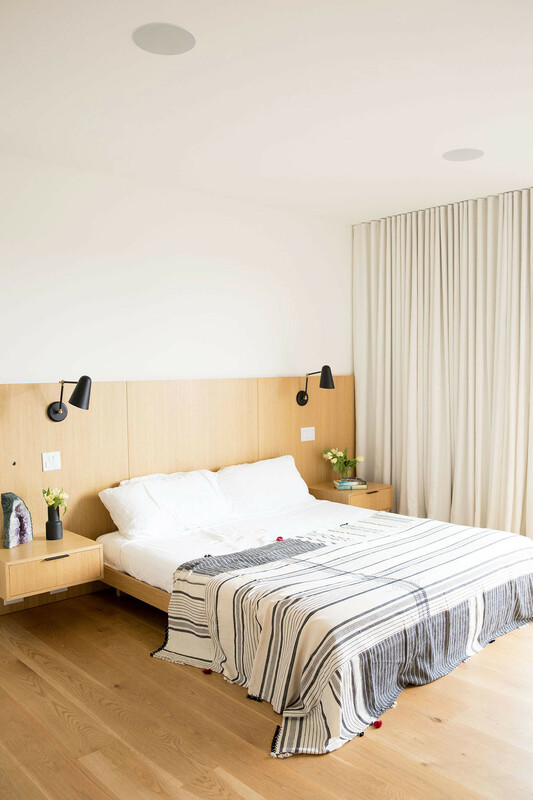 Upstairs, the couple's master bedroom is home to another of Stevens' favorite features, a sleek and stylish custom oak bed, complete with floating bedside shelves. Modern black wall sconces by Cedar & Moss create a sense of contrast when mounted on bare wood, alongside the soft and sinuous neutral bed linens by Parachute Home and full-length drapes. The soulful business coach admits her custom Potter Mallis bed is among her "favorite design features". Parachute Home Bedding | Cedar & Moss Wall Sconces. Inside daughter Grace's nursery, the couple achieve pure cohesion. 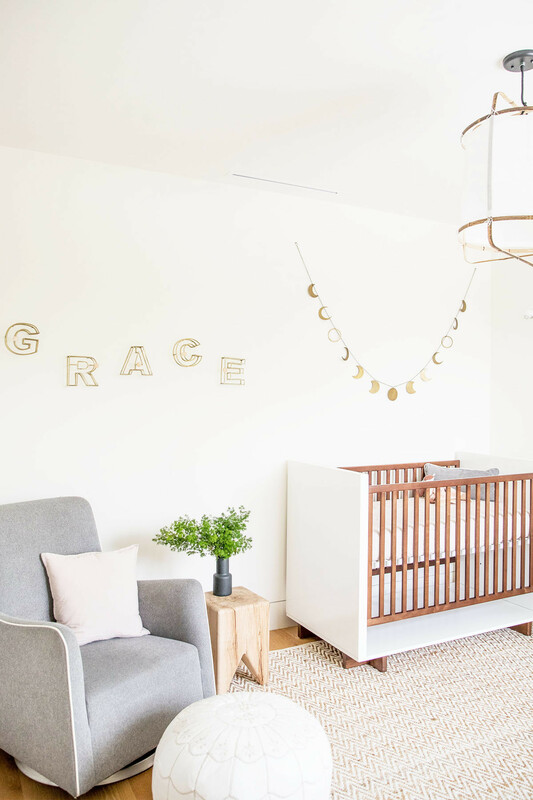 Adhering to a gender neutral palette, with little more than a cozy crib, tan herringbone area rug, modern garland, and gold signage reading 'Grace' delicately draping overhead. Daughter Grace's nursery is cozy yet minimal, adhering to a gender neutral color palette. Room & Board Crib | Monte Armchair | Serena and Lily Pouf | Matteo Pillow | Kalon Stool | Restoration Hardware Garland | Anthropologie Signage | West Elm Rug | Ay Illuminate Chandelier. "As much as our environment can support calm, I believe finding that inner peace quality is more of an inside job," Stevens candidly explains. "Our home is a reflection of who we are as a family. Yes, things will get messy and crazy, and maybe a little bit wild, but my husband and I have done a lot of spiritual work to make sure you can actually feel that inner peace within our house." Stevens, who runs her business from home, ensures her office space is both calming and efficient. Sara Karkenny Desk | Sara Karkenny Custom Shelving | CB2 Desk Chair | West Elm Assorted Frames | Sanso Potted Plants | Sara Karkenny Ceramics. As for the continuity of design, Stevens credits lead designer Todd Mallis, of Potter Mallis, for helping the family eventually get there. "Todd is incredibly intentional," she says. "He supported me with all of the design decisions, and on the finishes, and made sure that the clean lines were continued throughout the home. I wanted to keep things clean and ultimately timeless — less is definitely more." While the Stevens' clean, contemporary space serves as a retreat from the daily grind, the business coach ensures working from home is carried out with optimal efficiency. "You’ll often find me taking calls by the pool," she admits. "Playing ball with (my son) Harrison after school, or meditating out on our balcony. And when the weather really starts to heat up, our sliding doors are always open." The office, conveniently detached from the lower living area, continues this sense of calm, achieving a clean aesthetic, with floating Sara Karkenny shelves, neutral accent pieces, and a white-washed oak desk. As for any parting words of wisdom when it comes to designing your dream space with two young children in tow? "Keep it simple," Stevens insists. "Incorporate open space, for movement, wherever you can, whether it’s for your kids or for entertaining guests — the more space you have, the better."